What is it about the start of the year? Is it a summer thing, or does life just regularly go a bit haywire in January? Last year this time was not a good time ... seems like this year is trying to catch up. Doing my best to stay positive, though. Kinda. The Good I've finished the book! Yes, 11:15 pm on Saturday night. Hurrah! Never thought it would be over ... over 3,100 files created in 3 months. I put in a 14 hour work day on Saturday to get it all done, to get a whole two days off. There was champagne! This isn't the end of the process, though. I've now got 4 weeks of Author Review - addressing all the edits / comments / suggestions made on the text and puzzles by Sarah (Project Editor), Megan (Copy Editor), and Raymond (Technical Editor) One quarter of the book each week. So I'm not out of the woods yet. But at least I'm working on existing stuff now, not having to write new material. Fair bit easier. I've got a second book waiting in the wings, too, for Hinkler Books - a sticker / puzzle book for 5-year-olds. To be finished by early March. This one is worrying me for reasons below. Hubby's lovely Uncle Paul isn't going well. He got bowel cancer a few years ago, and in fact has lived longer than anyone expected. But the doctors now say they can do no more, and are setting up palliative care in his home. Paul is a professional, and very talented, watercolor artist. His wife is the one who designed these crazy and wonderful knitted vegetables. He is a handsome, softly-spoken, intelligent and lovely man. Hard on his sister (Hubby's mum) too. It's all rather crap. I called the hospital yesterday to find out where I was roughly, on the waiting list for my hip replacement. Remember when I signed up back in September? A year's wait, they said. Plenty of time, they said. I was cool with that! Well, they lied! Next bloody month!! "February - early March at the latest," said the chirpy young thing on the other end of the phone. What, this year?! Aaaaaaaaaaah! I know it needs to be done, and I still think I've made the right decision, and my doctor and physio are really happy – but I really wasn't counting on it happening quite so soon. I'm feeling a little tense about getting my contracted work done at the same time as dealing with all the hip stuff. I don't feel ready. I hope that working on the various books will be a distraction while I'm in hospital, and that I'm not in so much pain / doped out on pain killers etc that I can't work, and there aren't any complications. Ideally I'd like to have taken a good month off for the operation and recovery. Bugger. I've already put time restrictions on my surgery booking, and can't keep changing the date otherwise I'll be dropped from the list altogether... here's hoping the exact date will be early March, and not in February. And hopefully my publishers will be understanding. I've been working towards having all of March off, so hopefully that can still work for my rehab (although it won't be quite the holiday I was imagining!). Insert general complaint about living with two young adults, and a chronically-ill husband. Nothing specific, have just generally had enough at the moment. Working practically non-stop while the rest of the family is in bed or lounging around for whatever reason (illness or school holidays) is starting to get to me. Funny, that. 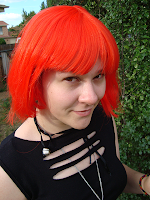 To mitigate the above, here's Dotter in a slightly red wig - crazy, or cute, or crazy and cute? I probably shouldn't be writing when I've only had 5 hours sleep, so please take the above with a dash of salt, and I'll catch you on a happier day before too long, I'm sure. Ah, you are carrying quite a load of different things aren't you? You've done an amazing slog to get the book written, and I'm sure the revising will seem much (a bit?) easier compared to that. As for the hip, at least the sooner it's done, the sooner it's not hanging over your head any more. That may well be a really good feeling afterwards! I hope the timing all works out well for you. Congratulations on finishing the book!! That is fantastic! I hope everything else improves for you especially the timing for your hip thing, and the book edits etc. Jolly good news about the book!! Nice to see that thus far, there is no 'Ugly' in your year, so it's not all bad!!! Your name should be Atlas! Hope Hercules comes along soon and gives you a break. Getting your FIL off your hands should be a big help. And really, your editors will just HAVE to be understanding, won't they? give them lots of advance warning and they might even extend your deadlines. I vote crazy and cute for dotter's wig, but I'm a fan of hair color. Hugs and eek all at once on the hip replacement. Yay, sure, but I think anyone's entitled to a freak-out when faced with orthopedic surgery, let alone someone who has had a bad experience. Hang in there, and good luck. Just think - you will have the rest of the year without your hip op hanging over your head! Good luck with it. You are a strong woman so you will manage this I have no doubt. Congrats on the book. And I vote crazy and cute too! Congratulations on finishing the book! It's another big tick off your list. Very sorry about the other illnesses in your family though. Hope the home care people can sort out FIL. As for the loungers, you may have to do an intervention and just go on strike. So much going on. So very much. It never ends for you guys does it. Hugs. But finishing the book is fabulous. And Dotter's wig is gorgeous. Really. 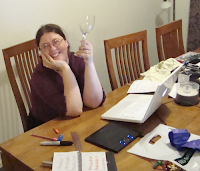 Yay for book finishings - you rock! And timing, things will sort themselves out.